For switches, the program automatically assigns the names SW-1, SW-2, SW-3, and so on. Whether the switch is connected as a Feeder (such as to a cable, busway, or transformer) or as a Tie (between two buses). Open/Closed Normal state of the switch. If Open, the one-line displays "OPEN" next to the switch symbol. If Closed, the one-line symbol does not show the "OPEN" tag. Group Name/Type If the switch is part of a functional group, the group name and type appears here. See Functional Groups. Provides a list of manufacturers available in the device library. If the desired manufacturer is not listed in the device library, you can add it to the library. If the desired manufacturer is missing from the list, select Other. Style Switch styles available from the manufacturer chosen in the Mfr field above in the type specified. After you choose a manufacturer and type, the styles available in the yellow column of the corresponding device library page are displayed here. Displays the standard used for short circuit calculation based on the selected type of fuse. Continuous Current Continuous current of the switch. This value is for reference only and does not affect analysis. The estimated time it takes to open the circuit. Momentary / C&L (kA) Momentary or close & latch rating of the switch. 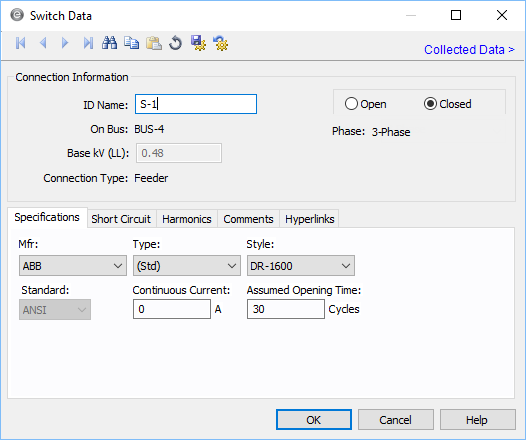 The values available from the device library are typically the close and latch values for spring and mechanically operated switches, since this is the lowest rating. Some switches, however, have only momentary ratings. The peak withstand current is equal to the rated short circuit making current. Calculate Fills in a computed value for based on the device library entry for Mfr, Type, Style, and the base kV. You can override this value by typing in a different number. EasyPower can monitor whether or not the IEEE 519 guideline for harmonics is met at the point of common coupling. If selected, then the Harmonics Report indicates when this guideline is not being met. kVA Demand The kVA demand. PCC Isc/Load The ratio of short circuit current to load current at the point of common coupling.